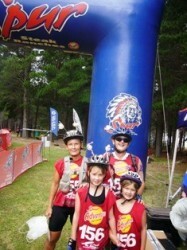 16km mtb, 5km trail with natural obstacles, water inflatable obstacle at the finish. 6-7km Hike on footpaths on circular routes. Kids start with a “sak resies” and follow a marked trail on foot, negotiating a number of obstacles and surprises along the way and including live demonstrations/chats on birds/snakes/other wild life or flora. They will be guided, marshalled and entertained in many ways if they do not join up with their parents straight after their event.